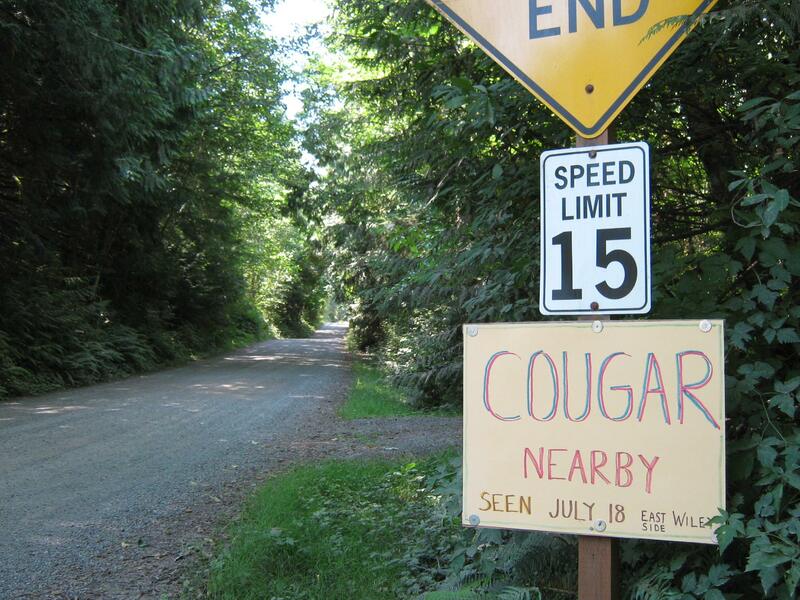 We received a photo from Christi Killien of a sign made by her husband after a neighbor saw a cougar in the vicinity of Wiley Lane SE in Olalla, a mile-long, rural deadend road with “lots of kids.” The neighbor told Killien the cougar moved silently and swiftly into a tree that was 30 feet away from where it was first seen. According to Dave Smith, author of “Don’t Get Eaten: The Dangers of Animals that Charge or Attack,” cougars will attack children and lone adults. He recommends traveling in groups, keeping children close and carrying a stick for defense. — Don’t run. Flight triggers the cougar’s instinct to pursue. — Stand tall, maintain eye contact and make yourself look as big as possible. — Adults should pick up children to prevent them from running or making sudden movements that could incite the cougar to attack. Alternately, instruct kids to grab your leg or at least crowd around the adult. My relatives on the East Coast are in awe of the stories I tell about frequent encounters with wildlife. We are fortunate to live in a place where wild animals still have relative freedom to roam, but the tradeoff is being aware of precautionary measures for staying safe.